Finally seeing a book you’ve written make it into print is an odd experience. This is probably a widely felt sentiment amongst first-time authors, but the feeling is exacerbated when the research for the book — and indeed, in many ways, the writing of it — began more than six years ago. Six years is a long time, both for the Internet and for a PhD student in his late 20s; in six years, both you and the subject you are writing about are likely to have changed a great deal. And, in our online era, much of that change is public in ways it might not have been 20 or even 10 years ago. I’m calling this post a “post-mortem” because the weird thing about books is that they are dead. Thought and scholarship are living, breathing experiences; articles, and especially books, are congealed thought. In our digital age, this might not be true forever — perhaps in 20 years, every book will be updated all the time. But I doubt it: The human need to fix things solidly is too strong. I don’t think there’s actually anything wrong with books being dead — indeed, they help freeze things that are changing too fast for us to get a handle on them. But this moment of “freeze-frame” still makes you think hard about the relevance of what you wrote. In this post, I want to revisit some of the things about Rebuilding the News that I still think are true today. Rebuilding the News is part of what might be called the ethnographic tradition in newsroom research. Extending from the work of Herb Gans, Gaye Tuchman, and Mark Fishman in the 1970s, to Nina Eliasoph in the 1990s, to Pablo Boczkowski and Nikki Usher today, newsroom ethnographers treat journalists as a tribe and seek to understand the rituals, work processes, and items of symbolic value to that tribe. Writing this book in the digital age made me think hard about some of the basic tenets of ethnographic research, actually, and I’m going to get to that rethinking in a future post. But for now, this is what ethnographic research basically is: We go and pitch our tents in the newsroom, or the lab, or the hacker conference, or wherever, and the people and objects we analyze there are our tribe. 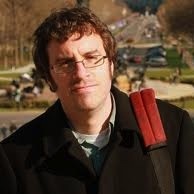 I originally conceived of Rebuilding the News as one half of a two-part project: I was interested in understanding how journalistic theory (what journalists did in school) and journalistic practice (what journalists did in their jobs) hung together to create journalistic authority: the cultural belief that journalists were a professional group whose truth claims were worth taking seriously. But once I had finally cajoled, bribed, and sweet-talked my way into Philadelphia newsrooms (don’t laugh! these are honest-to-god ethnographic skills), I pretty quickly realized that my intellectual scaffolding was going to have to change. There was way too much going on in journalism in 2007-2009 to stick with the original education/practice dichotomy. 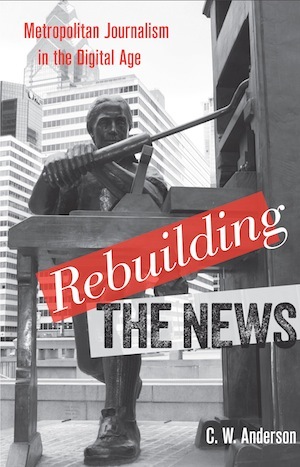 And so my book became an ethnography of the Philadelphia news ecosystem, and how it was adjusting to the tsunami of change that had just crashed in on the news business. So what do I think is still relevant in Rebuilding the News, all these years after I started my research? After all, a lot has changed (and continues to change) in Philadelphia since I did a lot of the fieldwork for the book. I want to mention two things in the book about journalism that still hold true today. In a later post, I also want to mention two things about the book that might make it valuable for scholars who are just starting out their research. Journalists will probably find the first post more interesting; graduate students and other academics might be equally interested in the second. The public is still a problem in journalism. There is a long tradition of research in journalism — arguably going back as far as the writings of John Dewey and Walter Lippmann, but really taking off in the 1990s — which saw the crucial dynamic driving journalism as its relationship with — and misunderstanding of — what political theorists called “the public.” The public was journalism’s totemic reference point, its reason for being, but journalism in the 1980s and ’90s was accused of “forgetting” the public, or else substituting the views of savvy Washington insiders for the real public. I argue that, in a digital age, the journalism-public relationship is still paramount, but in a different way than the civic journalists of the 1990s assumed. Rather than the public being eclipsed or forgotten, there are instead too many publics. Or rather: For journalists in the digital age, the public is everywhere, but it is different than journalists originally thought when they knew less about it. This public-journalist relationship, examined ethnographically, is one of the driving dynamics of Rebuilding the News. Reporting is a bizarre way of building knowledge (and we actually know very little about it). One of my research traditions is known as science and technology studies (STS), which is concerned with, among other things, how cultures construct and certify knowledge. This isn’t philosophy (“What counts as ‘true’?”) but anthropology (“How does truth get built?”). In my academic days, I was highly impressed by the STS work being done in scientific laboratories, technology firms, and other places where modern truth regimes are being built. So when I went into the newsroom, the STS perspective was always in the back of my mind. “How are journalists different than scientists?” I’d ask myself. “What are the ways that journalists build knowledge?” In other words, a pretty basic question: What is this thing we call reporting anyway? My answer may be unsatisfying: We don’t know, and while we’re trying to figure it, the answer is changing radically. Oh, journalists know what reporting is — but we as scholars need to do a better job of getting reporters to articulate their tacit understandings of this topic, preferably in a manner that explicitly contrasts reporting with other knowledge-construction professions like science, law, and indeed, sociology itself. All the while we do this, though, there are new nuances to reporting and new “objects of evidence” that impinge upon journalists’ reporting practices, changing what reporting is and will be in the future. And so, despite everything that has changed for journalism, in Philadelphia and elsewhere, I think these two things remain: The public is still a problem, and we still don’t understand reporting. I’m hoping to continue exploring these topics in future academic work. I’m also hoping that other researchers will take them up as challenges to be met, or hypotheses to be debunked/argued with, or whatever. To do this, though, I also think we need to think about how we practice scholarship differently — and that’s a second thing I learned while working on Rebuilding the News. I’ll discuss two ways in which our scholarship might change in a future post. Anderson, C.W.. "C.W. Anderson: The public is still a problem, and other lessons from “Rebuilding the News”." Nieman Journalism Lab. Nieman Foundation for Journalism at Harvard, 18 Jan. 2013. Web. 22 Apr. 2019. Anderson, C.W.. "C.W. Anderson: The public is still a problem, and other lessons from “Rebuilding the News”." Nieman Journalism Lab. Last modified January 18, 2013. Accessed April 22, 2019. https://www.niemanlab.org/2013/01/c-w-anderson-the-public-is-still-a-problem-and-other-lessons-from-rebuilding-the-news/.